Goldfinger is a 1964 British spy film, the third in the James Bond series and the third to star Sean Connery as the fictional MI6 agent James Bond. 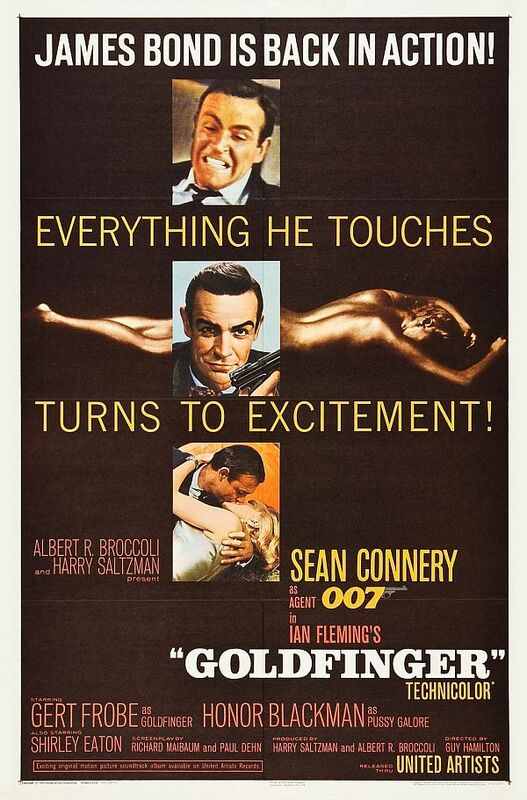 The film’s plot has Bond investigating gold smuggling by gold magnate Auric Goldfinger and eventually uncovering Goldfinger’s plans to contaminate the United States Bullion Depository at Fort Knox. The font used for Goldfinger (Film) logo is very similar to Clarendon Extra Bold, which is a slab serif font designed by URW Design Studio and published by URW++. You can preview and buy the Clarendon Extra Bold font on myfonts.com. In addition to Goldfinger (Film), Clarendon typeface is also used in the following logos, movie posters or album covers etc., including: Happy Wheels, El País, Crazy Heart, The Biography Channel, Lucasfilm Logo, Buck, Vs., Onkyo Logo, Finlandia Logo, Killing Lincoln, Vampire Hunter, Family Feud, Abbott, Searching for Sugar Man, Sony.